YouTube interview with Chinese SF writer Liu Cixin. About 25 minutes, very interesting, I watched all of it. He seems optimistic about technology the way RAW was. Thoughts on the NFL player protests, from Don Boudreaux. Amazon to adapt Snow Crash, Ringworld. Via Cat Vincent on Twitter, worth following. Richard Rasa's online alchemy oracle. Event that features John Higgs, Cat Vincent, others. I consulted Rasa's oracle and got image #6 "Tending the Inner Garden." The I Ching hexagram for it was #27 'Providing Nourishment." I love oracles and have bookmarked the page. I use them more for spiritual diagnosis than reading the future though the question I asked this time was about the future. Duquette wrote a whole book on ordinary, everyday things and processes that can be used as oracles. Bibliomancy with Finnegans Wake is another favorite of mine. The date of the Higgs/Vincent event is Crowley's 142nd birthday, a number that resonates with the ritual they have planned. As I was designing and building Carolyn's online oracle, I ended up asking it many questions. 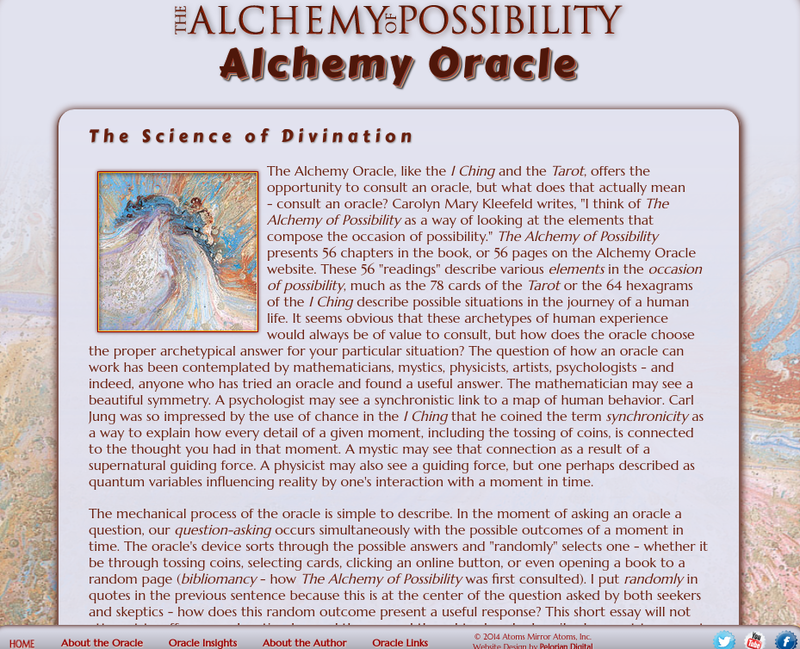 I'm used to using the I Ching, so I have something to compare to the online oracle. I know you can "bend" an interpretation out of any oracle text, but it seems uncanny that I so often got something from the online oracle that was very relevant to my question. Sometimes it was just the title of the entry that had a keyword that seemed particularly apt, but often the I Ching, Tarot, or Carolyn's text struck a chord.